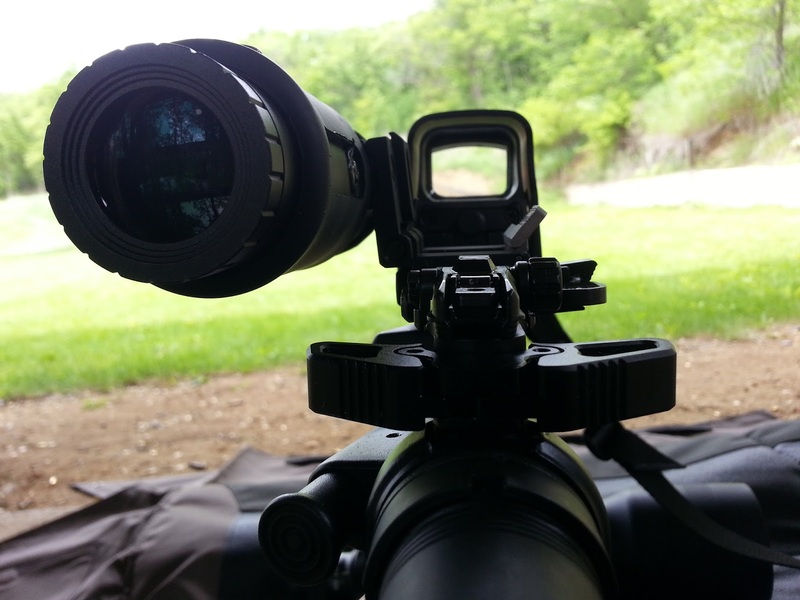 It doesn't take most people very long to realize that a magnified optic can aid in accurate shooting. Anytime we can see our target better there's a greater chance of success in the shots we take. 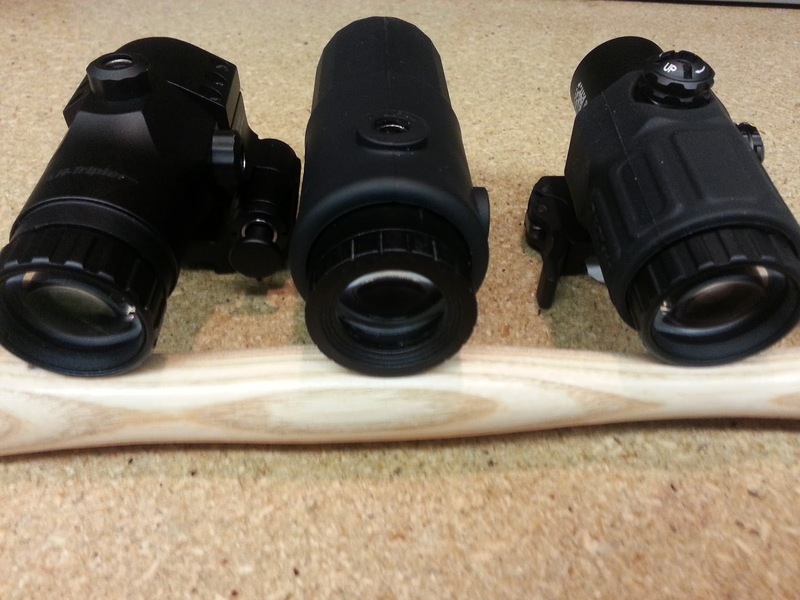 Magnification also allows for better identification of our targets at distance. These facts became very apparent to me years ago which took me down the path of deciding what optic would be best suited for me. I initially saw the advantage of one power reddots from Aimpoint and EoTech but knowing that I'd have to add a magnifier behind the reddot was not very attractive to me. 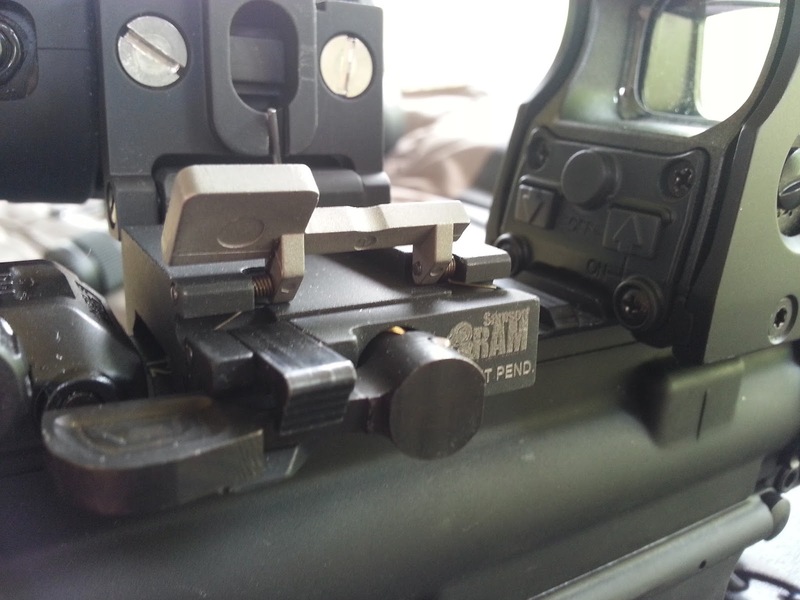 First there is the added weight of the additional optic and mount which will often weigh more than the reddot itself. Second, there is the price associated with magnifiers which can be equal or more than the reddot itself. I saw no reason not to use a variable power optic as I could always keep it on low power for close shots and increase the magnification, if needed, to take shots at distance. I've used both setups in close range drills and shooting out to 400 yards earning my Full Distance Rifleman Patch from the Appleseed Project. These are the two optic combos I've used most frequently and feel very confident with. 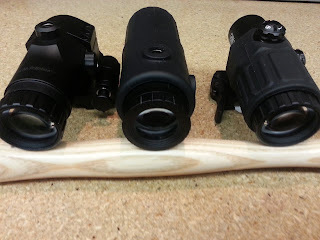 I do own a few reddots from various manufactures like Burris, Bushnell, Vortex and EoTech but have always thought of the variable power optics as more versatile and useful. Earlier this year I was chosen by Samson Manufacturing to take part in the OperationX program and the first product they sent out to us was their 3.5x Magnifier in their RAM Quick Flip mount. Since I had already written off the idea of using a magnifier/reddot combo years ago I was excited but skeptical to use it. The magnifier came packaged in a nice lockable plastic hard case along with the RAM Quick Flip mount and a spacer that could be added in case you are using an optic with a lower 1/3 co-witness. A small lens cloth, vial of blue Loc-Tite, hardware and product specification sheet were also included. I quickly assembled the optic and mount and hefted the combo in my hand. It was heavy when considering this was just a magnifier and not a complete sighting package. 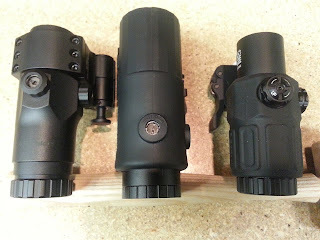 My preferred sight combos listed above are kept lightweight on purpose and the Samson magnifier/mount combo weighed in at 12.48oz. 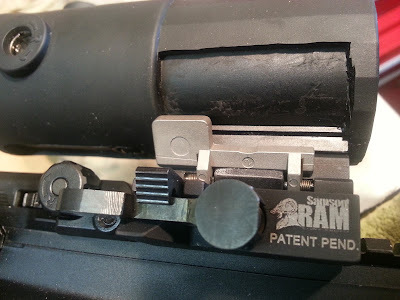 At first I thought that the RAM's locking mechanism was large but when compared to a LaRue Tactical QD Speed Lever; it had a similar foot print. The Rotary Actuated Mount (RAM) is constructed of stainless steel and has a throw-lever for operation. The lever is large enough to work with gloves on and provides easy one-handed on/off capabilities. 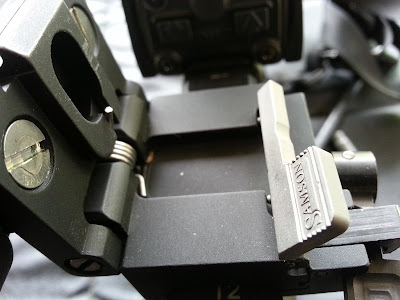 The mount has a locking piece that will keep the lever in a solid position. The RAM mount also features adjustability to compensate for over or undersized rails that may exist in the marketplace. This adjustabiliy ensures a solid lockup and repeatable tension. I did not need to utilize this feature while moving the combo from gun to gun. The optic interface was a simple 'flip-to-side' affair that provided enough spring tension to keep the magnifier out of the way until needed. 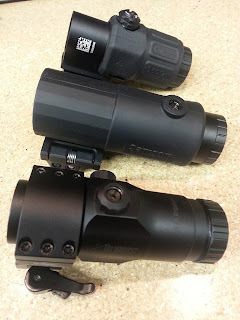 It only required a quick movement to lock the magnifier inline with the optic to take advantage of the 3.5x. It is important to note that you can mount the magnifier to allow the mount to flip to the left or right for your preference. The first thing I noticed about the magnifier was the large objective lens. It was easily the largest objective I've seen on a magnifier. The glass was clear from edge to edge with no distortion. The eye relief was pretty strict. Once I found a good placement for the optic I could only move my head an inch or so before shadows would start to creep in and create a tunneling effect. It is equipped with windage and elevation adjustment to ensure correct alignment and allow for adjustability if needed. There is also a fast focus ring on the ocular lens to ensure a crisp dot is displayed. Mounting was easy and I was shooting in no time. 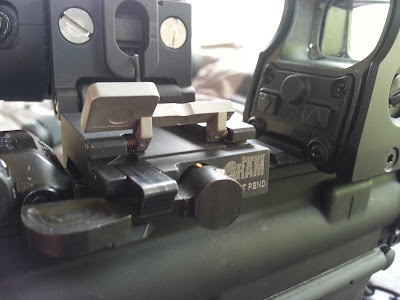 I first decided to try the magnifier behind an EoTech on my 300 Blackout SBR and found the extra magnification a welcome addition but the added weight was not my cup of tea. 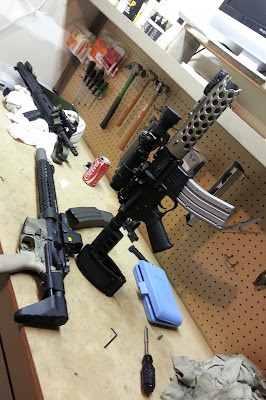 In order to stretch its legs a bit more I mounted it behind another Eotech on a 5.56mm 16" AR. The magnifier helped in boosting my confidence when pressing the trigger at a target 200-300 yards away. There is no doubt in my mind that extra magnification can help a shooter but I couldn't get over the extra weight that was added. It wasn't until I installed it on an already really light .22lr pistol build that I was accepting of the weight. 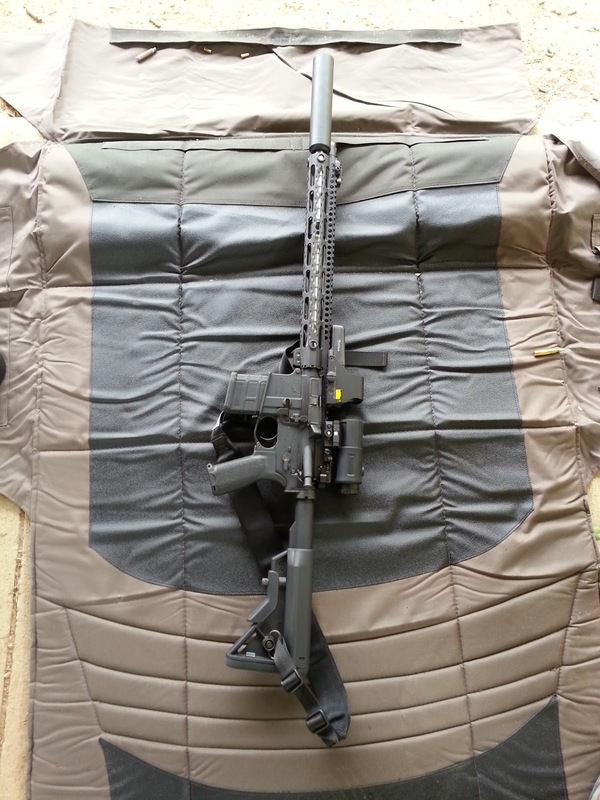 On the .22lr upper it was mounted behind a Burris XTS-135 and made for a great combo. There was one modification that I did to the magnifier that I thought was necessary. There is a rubber armor on the magnifier and it is relieved on both sides of the optic to provide clearance for the 'flip-to-side' lever. I found I could not consistently engage the latch in the stock configuration so I took a knife to cutaway more of the rubber armor. Once I removed a small amount allowing me more access to the lever I found it much easier to operate. Magnification can be a great tool and the use of a magnifier/reddot combo is very flexible. If you don't mind a bit more weight and enjoy the benefits of a reddot; this is the way to go. 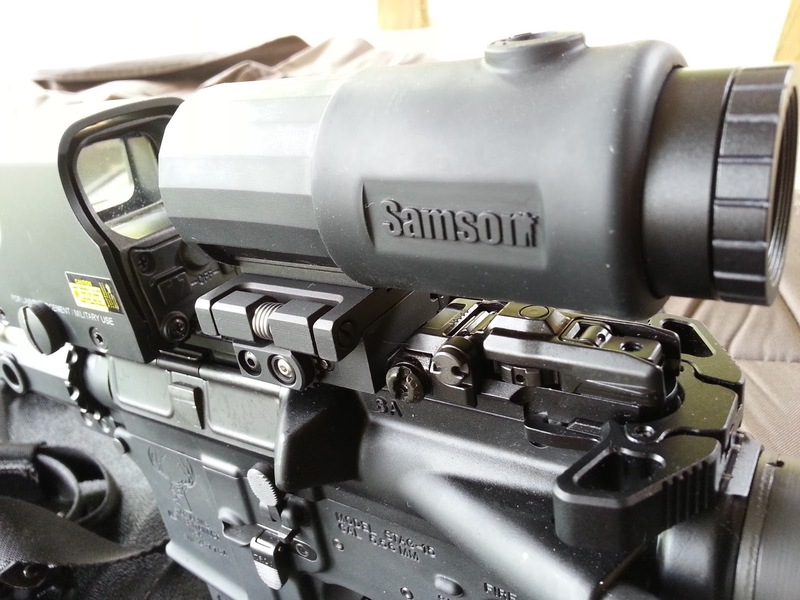 The Samson 3.5x Magnifier/RAM Mount Combo is priced competitively at $389 and offers great clarity with a rock solid mount. So, I`m definitely happy with my purchase and recommend it to everyone. I was using this tool for my old rifle 2 years ago . It was amazing and I have never forget the tastes of shhoting with it . 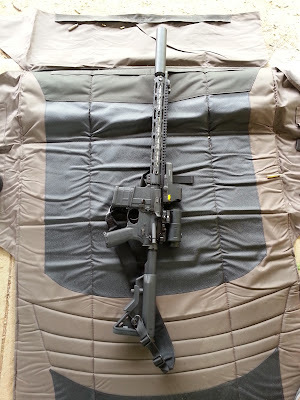 Now I have Ar15 and I realized that Nikkon p223 is the best suitable one for this rifle . I strongly recommend it if you have Ar15. This Samson Magnifier is the great choice for any one who has a AR-15. I have using it over 1 year and it works very well. I personally tested Samson Magnifier. It's good. Actually, anyone can compare this with a top brand product. 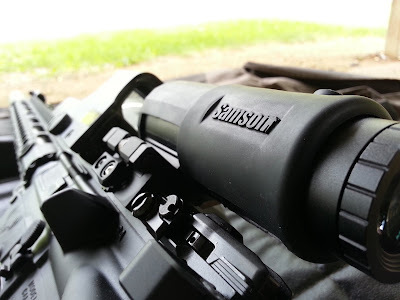 I am confused between Samson Scope and Nikon P-223 Scope. I heard weight makes a major difference which is often neglected? Which of these scopes is heavier. Or this weight thing is just a myth? This is a great review. You have explained everything in a very simple and easy manner. I loved this review. 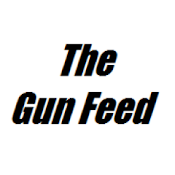 But we should also make sure to purchase a Rifle Gun Safe with a Gun. 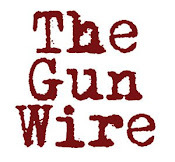 You can read about the Best leather Holsters. Great Article On a top a class Rifle optics. There is no better alternative than a perfect optics for hunting or tactical Jobs. 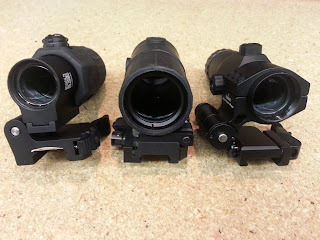 We have another similar article based on top affordable Reflex sights .